CPython uses a workflow based on pull requests. What this means is that you create a branch in Git, make your changes, push those changes to your fork on GitHub (origin), and then create a pull request against the official CPython repository (upstream). Clear communication is key to contributing to any project, especially an Open Source project like CPython. You should have already set up your system, got the source code, and built Python. Make changes to the code, and use git status and git diff to see them. Finally go on https://github.com/<your-username>/cpython: you will see a box with the branch you just pushed and a green button that allows you to create a pull request against the official CPython repository. You can still upload a patch to bugs.python.org, but the GitHub pull request workflow is strongly preferred. When creating a pull request for submission, there are several things that you should do to help ensure that your pull request is accepted. First, make sure to follow Python’s style guidelines. For Python code you should follow PEP 8, and for C code you should follow PEP 7. If you have one or two discrepancies those can be fixed by the core developer who merges your pull request. But if you have systematic deviations from the style guides your pull request will be put on hold until you fix the formatting issues. Second, be aware of backwards-compatibility considerations. While the core developer who eventually handles your pull request will make the final call on whether something is acceptable, thinking about backwards-compatibility early will help prevent having your pull request rejected on these grounds. Put yourself in the shoes of someone whose code will be broken by the change(s) introduced by the pull request. It is quite likely that any change made will break someone’s code, so you need to have a good reason to make a change as you will be forcing someone to update their code. (This obviously does not apply to new classes or functions; new arguments should be optional and have default values which maintain the existing behavior.) If in doubt, have a look at PEP 387 or discuss the issue with experienced developers. Third, make sure you have proper tests to verify your pull request works as expected. Pull requests will not be accepted without the proper tests! Fourth, make sure the entire test suite runs without failure because of your changes. It is not sufficient to only run whichever test seems impacted by your changes, because there might be interferences unknown to you between your changes and some other part of the interpreter. Fifth, proper documentation additions/changes should be included. Are there any whitespace problems in C files? Has the documentation been updated? Has the test suite been updated? Has an entry under Misc/NEWS.d/next been added? Has configure been regenerated, if necessary? Has pyconfig.h.in been regenerated, if necessary? The automated patch check doesn’t actually answer all of these questions. Aside from the whitespace checks, the tool is a memory aid for the various elements that can go into making a complete patch. Do not fix more than one issue in the same commit (except, of course, if one code change fixes all of them). Do not do cosmetic changes to unrelated code in the same commit as some feature/bugfix. raises the amount of spam in the module by making it more spammy. The first line or sentence is meant to be a dense, to-the-point explanation of what the purpose of the commit is. If this is not enough detail for a commit, a new paragraph(s) can be added to explain in proper depth what has happened (detail should be good enough that a core developer reading the commit message understands the justification for the change). Check the git bootcamp for further instructions on how the commit message should look like when merging a pull request. To accept your change we must have your formal approval for distributing your work under the PSF license. Therefore, you need to sign a contributor agreement which allows the Python Software Foundation to license your code for use with Python (you retain the copyright). You only have to sign this document once, it will then apply to all your further contributions to Python. If you don’t have an account on bugs.python.org (aka b.p.o), please register to create one. Make sure your GitHub username is listed in the “Your Details” section at b.p.o. Fill out and sign the PSF contributor form. 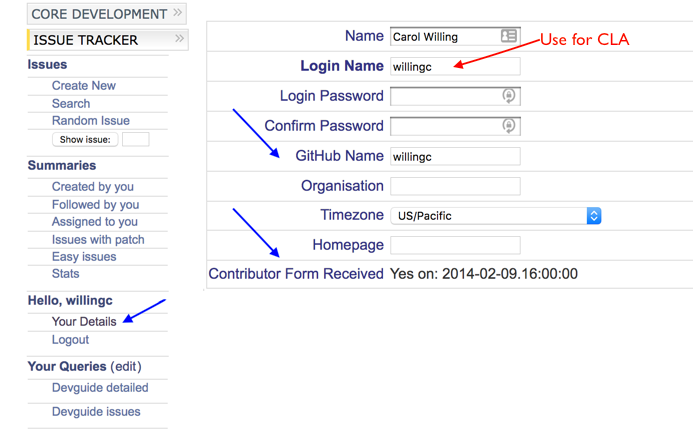 The “bugs.python.org username” requested by the form is the “Login name” field under “Your Details”. After signing the CLA, please wait at least one US business day and then check the status by going to the check-python-cla website. The check will also be run automatically the next time you push changes to your PR. Once you are satisfied with your work you will want to commit your changes to your branch. In general you can run git commit -a and that will commit everything. You can always run git status to see what changes are outstanding. This will get your changes up to GitHub. Now you want to create a pull request from your fork. If this is a pull request in response to a pre-existing issue on the issue tracker, please make sure to reference the issue number using bpo-NNNN in the pull request title or message. If this is a pull request for an unreported issue (assuming you already performed a search on the issue tracker for a pre-existing issue), create a new issue and reference it in the pull request. Please fill in as much relevant detail as possible to prevent reviewers from having to delay reviewing your pull request because of lack of information. If this issue is so simple that there’s no need for an issue to track any discussion of what the pull request is trying to solve (e.g. fixing a spelling mistake), then the pull request needs to have the “skip issue” label added to it by someone with commit access. Your pull request may involve several commits as a result of addressing code review comments. Please keep the commit history in the pull request intact by not squashing, amending, or anything that would require a force push to GitHub. A detailed commit history allows reviewers to view the diff of one commit to another so they can easily verify whether their comments have been addressed. The commits will be squashed when the pull request is merged. When a patch exists in the issue tracker that should be converted into a GitHub pull request, please first ask the original patch author to prepare their own pull request. If the author does not respond after a week, it is acceptable for another contributor to prepare the pull request based on the existing patch. In this case, both parties should sign the CLA. When creating a pull request based on another person’s patch, provide attribution to the original patch author by adding “Co-authored-by: Author Name <email_address> .” to the pull request description and commit message. See the GitHub article on how to properly add the co-author info. See also Applying a Patch from Mercurial to Git. To begin with, please be patient! There are many more people submitting pull requests than there are people capable of reviewing your pull request. Getting your pull request reviewed requires a reviewer to have the spare time and motivation to look at your pull request (we cannot force anyone to review pull requests and no one is employed to look at pull requests). If your pull request has not received any notice from reviewers (i.e., no comment made) after one month, first “ping” the issue on the issue tracker to remind the nosy list that the pull request needs a review. If you don’t get a response within a week after pinging the issue, then you can try emailing python-dev@python.org to ask for someone to review your pull request. When someone does manage to find the time to look at your pull request they will most likely make comments about how it can be improved (don’t worry, even core developers of Python have their pull requests sent back to them for changes). It is then expected that you update your pull request to address these comments, and the review process will thus iterate until a satisfactory solution has emerged. One of the bottlenecks in the Python development process is the lack of code reviews. If you browse the bug tracker, you will see that numerous issues have a fix, but cannot be merged into the main source code repository, because no one has reviewed the proposed solution. Reviewing a pull request can be just as informative as providing a pull request and it will allow you to give constructive comments on another developer’s work. This guide provides a checklist for submitting a code review. It is a common misconception that in order to be useful, a code review has to be perfect. This is not the case at all! It is helpful to just test the pull request and/or play around with the code and leave comments in the pull request or issue tracker. If you have not already done so, get a copy of the CPython repository by following the setup guide, build it and run the tests. Check the bug tracker to see what steps are necessary to reproduce the issue and confirm that you can reproduce the issue in your version of the Python REPL (the interactive shell prompt), which you can launch by executing ./python inside the repository. If the changes affect any C file, run the build again. Launch the Python REPL (the interactive shell prompt) and check if you can reproduce the issue. Now that the pull request has been applied, the issue should be fixed (in theory, but mistakes do happen! A good review aims to catch these before the code is merged into the Python repository). You should also try to see if there are any corner cases in this or related issues that the author of the fix may have missed. If you have time, run the entire test suite. If you are pressed for time, run the tests for the module(s) where changes were applied. However, please be aware that if you are recommending a pull request as ‘merge-ready’, you should always make sure the entire test suite passes. When you review a pull request, you should provide additional details and context of your review process. If you tested the PR, report the result and the system and version tested on, such as ‘Windows 10’, ‘Ubuntu 16.4’, or ‘Mac High Sierra’. If you request changes, try to suggest how. Comment on what is “good” about the pull request, not just the “bad”. Doing so will make it easier for the PR author to find the good in your comments. A core developer can dismiss another core developer’s review if they confirmed that the requested changes have been made. When a core developer has assigned the PR to themselves, then it is a sign that they are actively looking after the PR, and their review should not be dismissed. Once your pull request has reached an acceptable state (and thus considered “accepted”), it will either be merged or rejected. If it is rejected, please do not take it personally! Your work is still appreciated regardless of whether your pull request is merged. Balancing what does and does not go into Python is tricky and we simply cannot accept everyone’s contributions. But if your pull request is merged it will then go into Python’s VCS to be released with the next major release of Python. It may also be backported to older versions of Python as a bugfix if the core developer doing the merge believes it is warranted. Non-trivial contributions are credited in the Misc/ACKS file (and, most often, in a contribution’s news entry as well). You may be asked to make these edits on the behalf of the core developer who accepts your pull request.